The always busy corner of Infanta and Carlos III was a desolate wasteland Sunday. 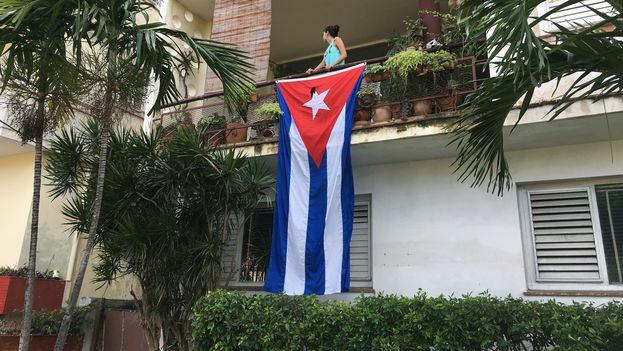 Since the death of Fidel Castro was announced, Havanans have gathered at home. The official media say that it is from pain, but fear is the protagonist of days in which the sale of alcoholic beverages has been prohibited and the biggest funerals in contemporary Cuba are arranged. Foreign journalists are arriving in the country by the hundreds and are seen in the streets trying to interview every passerby. Many pedestrians look down and refuse to give interviews. When the reporters finally manage to get some statements, they are only from those who agree with the official discourse. Inside people’s homes everything is different. “Luckily we had a bottle of rum left over from a party,” says Chicho, a retired teacher who has waited decades for this moment. “It is not that we’re celebrating the death of a human being, because this man made us all believe that he was not one… that he was above life and death,” he tells 14ymedio. Chicho has a nine-year-old granddaughter who will go to school early this Monday, although there are doubts about how the week will go in schools and workplaces, in the midst of the national mourning that has been decreed for nine days. “I’m sure that they aren’t going to teach classes, there is going to be one event and another until the day the ashes reach the Santa Ifigenia Cemetery,” says the grandfather. For Mileidis, a resident of Havana’s Regla neighborhood, there is another concern. “My brother is a son of Changó,” (an orisha of the Afro-Cuban religion who is the equivalent of Saint Barbara). The celebration of the saint is held every December 4, the same day the national mourning concludes. “I don’t know how we are going to get the brandy and rum,” the young woman worries. A well-known bar on Reina Street is deserted and the drinks list has been put away. Nearby, in El Curita park, three regulars of the place get together on a corner and pass a plastic container that looks like it contains cola. In reality it is distilled alcohol, better known as “train sparks” for the effects it occasions in the stomach when ingested. Police patrol cars and uniformed officers approach, and the three men hide the bottle. “This is my thing, I can’t live without it,” says one of the men, justifying his transgression. “What fault is it of mine that He can no longer take a drink?” he reflects, slurring his words. Posters with the face of Fidel Castro are everywhere. Since the celebration of his 90 th birthday in August, the tone of the personality cult has noticeably risen, such that Cubans seem to be used to Fidelmania. “Will they change the bust of José Martí in the schools for one of Fidel?” a seven-year-old girl asks her mother. In the street, Havana residents speculate about the anticipated tributes to Castro and expect the establishment of an official order in his honor, his face on a banknote, a multi-story iron relief with his silhouette in the Plaza of the Revolution — like the ones for Che Guevara and Camilo Cienfuegos – some street with his name, and a museum in his memory in the heart of the city. The most daring even predict a change in the only political organization allowed in the country. “It’s a good moment to shake off the communist label,” an official academic who asked for anonymity told this newspaper. “It’s possible that at the next plenary session of the Cuban Communist Party or at an extraordinary congress they will re-baptize it the Fidelista Party.